I don't know much about the Heisenberg Uncertainty Principle. I know, as the name suggests, that it has something to do with uncertainty. Through my online, thoroughly unscientific research, I find that the principle boils down to the idea that there are certain fundamental relationships that put limitations on knowing other things with certainty. In his new play, Heisenberg, Simon Stephens (The Curious Incident of the Dog in the Night-Time) explores the implications of the principle in interpersonal relationships. One relationship, in particular. Stephens's two-hander focuses on Alex (a subdued Denis Arndt) and Georgie Burns (a present, wiry Mary-Louise Parker (The Snow Geese)). Through a series of linear scenes, we see Alex, a 75-year-old man, and Georgie, a 42-year-old woman, meet, lie, reveal themselves, come together, come apart and reach an inconclusive conclusion. The play is only a brisk 90 minutes (direct by Mark Brokaw) yet it covers about two-months' time. Clearly, there are spaces in between. Those spaces (perhaps, the time In Creases) add to the uncertainty but, as Alex points out, are also where life happens. As Alex and Georgie are discussing a Bach piece, Alex tries to explain to Georgie the beauty in the piece. He says that what resonates is not the notes but the moments in between. In between each note you try to figure out what's going to happen next, but the music always goes somewhere you never would have expected. Ain't that the truth. It seems that Stephens is harnessing the uncertainty principle for good. He's saying, through these two seemingly mismatched people, that while some things are unknowable, made even more so by their relationship(s) to others, that elusive "something" that makes it unknowable can also be what makes the same thing unexpectedly beautiful. 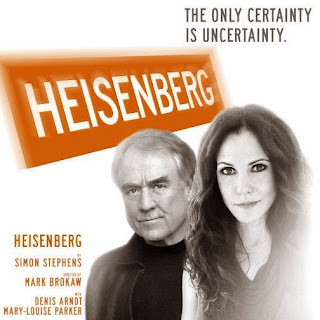 In this sense, Heisenberg (the scientist's name and his principle are never mentioned) is a modern romance. It's nothing groundbreaking, but it is something else to throw into the mix, to ponder in the spaces in between.